TL;DR: What are the security implications of using oauth2 for authentication? I'm building an app (site A) that allows users to perform operations on another website (site B) through a simpler interface. Site B provides an API that implements OAuth2.0 for authorization of my app. I was thinking I could avoid storing passwords and having users get yet-another-account at my app by piggybacking on site B's authentication. Of course I've read the literature bashing on the use of plain OAuth for authentication, but I fail to see how this is bad from a security perspective. They seem to mostly focus on the practicality and (lack of) generality of the solution. User Sally loads site A and clicks "login"
Site A gets the authorization code and exchanges it for an access token (and a refresh token) through site B's API. The tokens are stored in a database for use by a backend, which does all the real work on site B.
I'll note that I'm using the so-called "server-side flow" here. Also, the authorization_code returned in the third step is a short-lived one-use code that's tied to A's client_id and can only be used with the corresponding client_secret. When Sally logs in from another device the process repeats and the new tokens are stored. The only problem I see is that the user will be asked to authorize my app on every login instead of just the first time, but that's not a problem at the moment. I'd also be asking for a new token when I actually have a valid one in store. While a bit impractical, this isn't a problem at the moment(*). What I'm failing to see is how this is bad from a security perspective. With such a scheme: What are the security issues for the user? And for the app? OAuth2 is meant for a user to authorize an application to load the user's resources from some resource provider. In other words: OAuth2 is a mechanism for delegation of authorization. The protocol does not support authentication (although it is commonly misused for exactly that). The security hole is in the assumption you make in the 5th bullet point. Site A asks site B for the user_id from the user-data that the access_token grants access to. 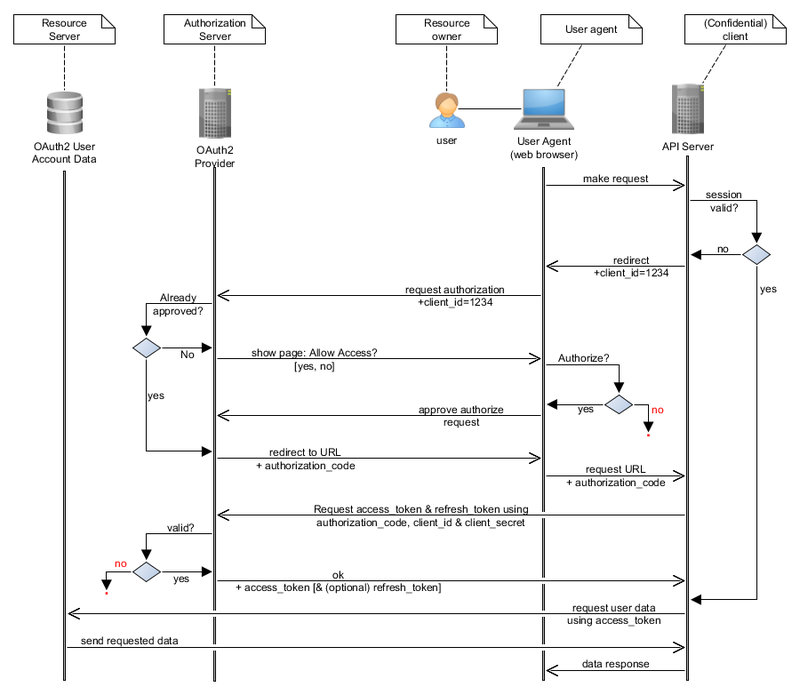 Figure 1: OAuth flow for (confidential) clients. If all goes as planned, the access_token is, indeed, from the user you redirected to B for authentication. But: there is no guarantee that is the case. In fact, any (malicious) website that the user has previously granted the right to access the user's data (using OAuth2 with B), can get a valid authorization_code from B and send it to you, in bullet point 3. In other words, if I run a website which asks users for their permission to access their resources at B using OAuth2, I can impersonate all those users at all websites which misuse OAuth2 (with B as OAuth2 Authorization server) for authentication. The 'problem' with OAuth2 is that the authorization_code is not generated for a specific client_id. So if you receive an authorization_code, you can not be sure if B issued the authorization_code you received to you, or to some other service. Which is deemed acceptable for authorization but is absolutely unacceptable for authentication. I believe that you are here adding an extra precaution, which is not mandatory in the OAuth protocol. As such, it cannot be relied upon. As explained by Jacco, a naive implementation of authentication on top of oauth2 has several vulnerabilities, the most common of which is CSRF. Given there's a perfectly good authentication protocol available without all this pitfalls, it's not a good idea to roll your own. OTOH, there's a lot to learn by doing it and understanding and fixing these issues. TL;DR: don't use oauth2 for authentication unless you're doing it to learn why you shouldn't do it. Use OpenID Connect. There's several possible "flows" in oauth2. The one I focused on for my project was the authorization_code flow. Browser-based flows expose protocol parameters to potential attackers via URI query parameters (HTTP referrer), the browser cache, or log file entries, and could be replayed. In order to reduce this threat, short-lived authorization "codes" are passed instead of tokens and exchanged for tokens over a more secure direct connection between the client and the authorization server. It is much simpler to authenticate clients during the direct request between the client and the authorization server than in the context of the indirect authorization request. The latter would require digital signatures. So authorization codes are more secure, yay! authorization_code flow vulnerabilities are analyzed in section 4.4.1 of RFC6819. This section covers a lot of ground. I'll just focus on a few of the threats. An attacker could authorize an authorization "code" to their own protected resources on an authorization server. He then aborts the redirect flow back to the client on his device and tricks the victim into executing the redirect back to the client. The client receives the redirect, fetches the token(s) from the authorization server, and associates the victim's client session with the resources accessible using the token. The client MUST implement CSRF protection for its redirection URI. This is typically accomplished by requiring any request sent to the redirection URI endpoint to include a value that binds the request to the user-agent's authenticated state (e.g., a hash of the session cookie used to authenticate the user-agent). The client SHOULD utilize the "state" request parameter to deliver this value to the authorization server when making an authorization request. So in your redirect to the oauth2 provider you simply add a parameter state, which is simply a CSRF token (should be unguessable, stored in a secure cookie, etc.). This token will be sent back along with the authorization_code when the oauth2 provider redirects the user back. The countermeasure for this attack has to be implemented by both the client and the authorization server, and can also be enforced by the authorization server. The state parameter is also covered in this sec.SE question. This one (covered in section 4.4.1.13 of RFC6819) is specifically aimed at the authentication over oauth2 scenario. Basically an attacker obtains an authorization_code for the user through a malicious site (let's call it site C) and sends it to the legitimate site (which we're still calling site A) which exchanges it for an access_token that is then used to assert the user's identity through the resource server. This effectively lets the attacker login as the user on site A. This is the one mentioned by Jacco in his answer. All clients must indicate their client ids with every request to exchange an authorization "code" for an access token. The authorization server must validate whether the particular authorization "code" has been issued to the particular client. If possible, the client shall be authenticated beforehand. Believe it or not, the previous attacks and their countermeasures cover most of the threats to authentication when using the code flow. These should all be implemented by the authorization server. These should also be implemented by the authorization server. This one should be implemented by the client, and probably enforced by the authorization server. Nope. Don't do it. Use OpenID Connect. Clients should use an appropriate protocol, such as OpenID (cf. [OPENID]) or SAML (cf. [OASIS.sstc-saml-bindings-1.1]) to implement user login. Both support audience restrictions on clients. There you go. Use that instead. If you still want/need to authenticate against an oauth2 provider, first make sure your provider implements all the countermeasures previously mentioned above. If it does then you may be able to pull it off. Test extensively and hire a security team to perform a full analysis of your solution. Also, make sure all the provider's features that you rely on for security are documented in you provider's API, otherwise they might be removed without previous notice and you end up with a Very Broken™ product. Also, I learned enough about oauth2 throughout this implementation to make it well worth it. If you want to know more, read both RFC6819 and RFC6749. I also found this site very useful. If the user has an active session at site B, and other websites (site C, D, etc. ) can use the OAuth system of site B for their authorization, a malicious site ( e.g. site x ) could grab access tokens from site B and potentially use token replay to impersonate the user on your site and carry out actions that were not authorized by the user. Re-read the Facebook example in your links, it explains the problem. The challenge with the entire scheme is that your site is only going to be as secure as the OAuth API of site B. As we just demonstrated, their API is not secure because third parties can abuse it. In the case of abuse, your only resource is to appeal to site B to ban site x. Personally I would not want to leave the fate of my security in the hands of a site I did not own. A more secure mechanism would provide authentication of your site against site B's list of accepted OAuth clients, preferably using public key client certificates, and would prevent token replay by limiting token use to the requesting site. You can't force site B to adopt that kind of access scheme, so you are limited to whatever level of security they provide. Not the answer you're looking for? Browse other questions tagged authentication oauth or ask your own question. Is it safe for users of my API to 'Sign In With GitHub' using passport-github? What are the risks of using OAuth for authentication when in control of both ends? Why can Oauth2 redirect_uri be a non-https URI? How to handle OAuth2 refresh_token for sessionless login?